A year ago, I received a Nokia Lumia as a developer gift from Microsoft and Nokia, saying that they would have looked forward to see whether I could create a good app for their ecosystem (which is Windows Phone). Since that May 2012, I've made a couple of simple apps and developing for Microsoft's platform have been so much fun. 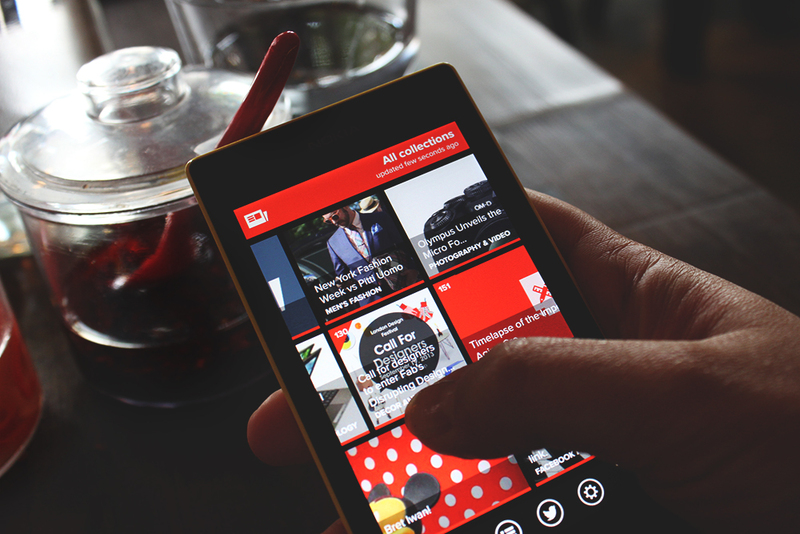 However, that's not the end of the story because last March, after crossing my fingers for months hoping to see a high-quality newsreader like Flipboard, I gave up and then I started to think about making the missing news reader for Windows Phone. It required two months of intense programming iterations plus a lot of UI/UX testing and pre-launch stress to create what nowadays is one of the best readers for Windows Phone - as the users keep saying. It also required someone who could help me filling up all the contents, from blogs to popular websites, and could also invest time refining the app with some fresh ideas. That person was Michela, who stills in charge of managing the app's content and not as last the app branding and identity. But Collector does more than a simple RSS news reading app. During the past months, we've also integrated into Collector almost every one of the biggest social networks, so you could read your Twitter or Facebook timeline like you were reading a newspaper, or do the same for a Tumblr blog or even an Instagram feed. Collector also supports Google Reader feed import and Pocket to save your favorite articles for later. Right now, I'm slowly adding some extra features like Feedly integration, while Michela is thinking about designing the UI from scratch and make it more beautiful than it is right now. If you have a Windows Phone device, you should definitely give it a try! Just search it on the marketplace and please, let me know your thoughts and feedback about it.